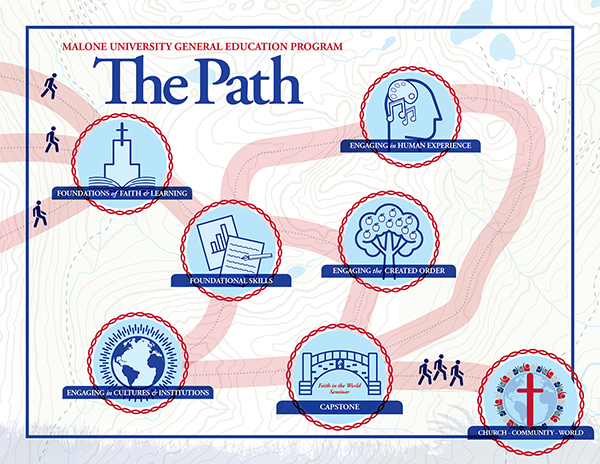 The General Education Path at Malone University seeks to guide students along the path of wisdom as they discover their calling, develop critical and creative thinking skills, and mature into faithful, socially aware world citizens who are prepared to serve, to solve problems, and to be agents of transformation in the communities in which they live and work. The Path begins with a seminar of community building and self-discovery and continues through a core curriculum that requires students to apply critical thinking and creative expression. These courses progress from Foundations courses that establish a strong framework for Christian higher education to engaging courses designed to deepen and expand our understanding of people, creation, our nation, and our world. In some components of the Path, all students take required courses in common; in other components students have opportunities to make choices and follow The Path that best fits their interests and calling. The Path culminates in an interdisciplinary capstone course, which serves as a bridge to life beyond Malone University. The General Education Path provides a solid grounding in Christian scriptures and tradition, along with many additional opportunities for growth in self-knowledge, knowledge of God, and knowledge of the challenges, complexities, and opportunities of our changing world. While the world around us changes, one thing remains true: “The path of the righteous is like the morning sun, shining ever brighter till the full light of day.” (Proverbs 4:18). At Malone University, the mission of general education is to develop wise and thoughtful students who are broadly educated in the liberal arts as well as in Christian scriptures and traditions to serve as faithful agents of transformation in the communities in which they live and work. Foundations of Faith & Learning provides students with courses that offer them a solid foundation in the ethos of Malone as well as courses in Bible, theology, and philosophy. Foundational Skills are essential to every college education. Courses cover composition, communication skills, and a math/psychology class in statistics. Engaging the Created Order helps students develop appreciation for the beauty of God's creation and prepares them to be good stewards. Engaging in Human Experience provides students with a basic understanding of literature in society, understanding others, and the Fine Arts. Engaging in Cultures & Institutions provides students with an education in modern world history and a study of American-specific cultures and institutions, as well as a global encounter that can take place beyond the classroom. Capstone is the culminating course in a student's education - with a variety of courses offered that are designed to engage the student's entire educational experience. Called the "Faith in the World" seminar, this course is offered in the student's final semester as a bookend to their 'Gen 100' course.